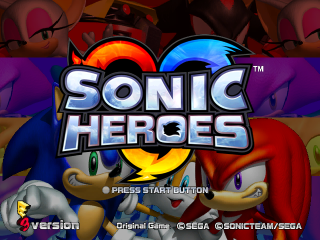 Sonic Heroes E3 version for the GameCube was a demo of Sonic Heroes, displayed during E3 2003. A disc image dump was released to the public on April 6, 2016, in a joint effort between Sonic Retro and Spanish fansite Sonic Paradise. This prototype requires either a development version of the Dolphin emulator or Nintendont to run. The disc will not natively boot on a retail GameCube or Wii, nor will it run on regular Dolphin builds. Certain HUD features are missing, and hint text is displayed differently. The title screen is very different, depicting scrolling banners with all four teams. This title screen was even used in the 10.8 prototype. The demo only features two playable stages: Seaside Hill (labelled as "EASY") and Rail Canyon (labelled as "HARD"). Team Sonic is the only playable team for both stages. There are no title cards. The loading screens simply feature the three team rings in the bottom-right corner. The HUD does not display the player's score. The timer in the HUD does not count up; rather, it counts down from 9 minutes and 59 seconds, essentially placing a 10-minute time limit on the player. There are no Power Cores yet, meaning the player cannot level up teammates. Likewise, the HUD does not show team levels. Team Blasts cannot be performed. For some reason, the game will restart after being paused for a short while. All the hints are simply text with a blue backdrop. When the player passes a Checkpoint, they will receive different items depending on which character is the leader. Sonic gets Power Sneakers, Tails gets 20 Rings, and Knuckles gets a Shield. There are missing graphical effects when spinning off of poles. When finishing a level, the HUD does not disappear, the music does not stop, and the camera for the end level cutscene goes all wonky at the end of the level, panning away from Team Sonic. When the game ends, a "Coming Soon" screen appears, and then the game resets. Seaside Hill's theme is missing most of its drums, and the electric guitar is mixed slightly different. Rail Canyon's theme uses different drums. The Power Sneakers jingle does not play. Some sound effects and voice clips are missing. Tails has a different voice clip when using Thunder Shoot. All three members of Team Sonic have different voice clips when dying from enemies. There is no spoken dialogue at all.